My mom used to call me "rice bucket" when I was a kid. In Chinese, that means a person who like to eat a lot of rice. I could have lots of plain rice with just a little amount of other food. Rice was not a side dish to me, it was my main dish. But, this was no longer true. Having too much rice in the past made me opt for other type of staple food whenever possible. Until one day, I found out that there were so many other ways to cook different types of rice in other parts of the world. 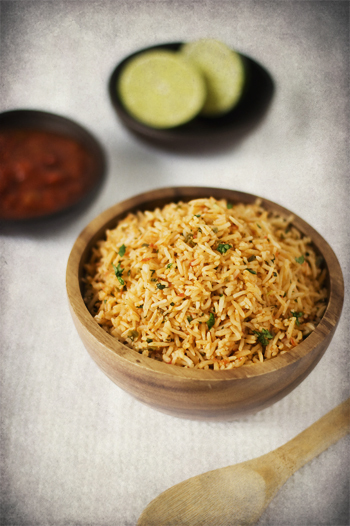 The result is usually extremely flavorful rice with distinguished texture depending on the type of rice you use. Having rice is not boring anymore. And once again, I become a "rice bucket". One of my favorite types of rice is Mexican red rice. I love the tomato flavor with a bit of spiciness from the jalapeno. 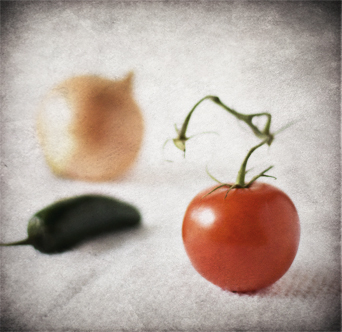 To make a complete meal and also to please N, I usually make the bean and beef burrito. But at anytime, I can just have the red rice by itself. The following recipe is coming from Cook's Illustrated. I have tried a few red rice recipes. The amount of tomato and onion is just right in this recipe, not too overwhelmed. As usual, the measurement showing is half of the recipe as this was how much I made. I have also modified the cooking method. This is a straightly stove-top method, in contrast with the oven method in the original recipe. But perfect cooking rice turned out every time! Process tomatoes and onion in food processor until smooth and thoroughly pureed, about 15 seconds. Transfer mixture into measuring cup. There should be around one cup of mixture. Pour one cup of chicken broth into mixture. Put it aside. Rinse rice through strainer under cold running water for 1 to 2 mins, drains and put it aside. Heat oil in a sauce pan over medium-high eat, about 1. When you put 3 to 4 grains of rice in the pan and the grains sizzle, the oil is ready. Add rice and saute, stirring frequently, until rice is translucent and light brown, about 5 to 6 mins. Reduce heat to medium. add garlic and jalapeno, saute for a min. Add the tomato mixture, tomato paste and salt. Bring to a boil and then reduce heat to low. Cover the rice and let it simmer for about 10 mins, until water is mostly absorbed by the rice. Uncover and let it cook under low heat for another 8 mins. Remove from heat, cover and let it stand for 5 mins. 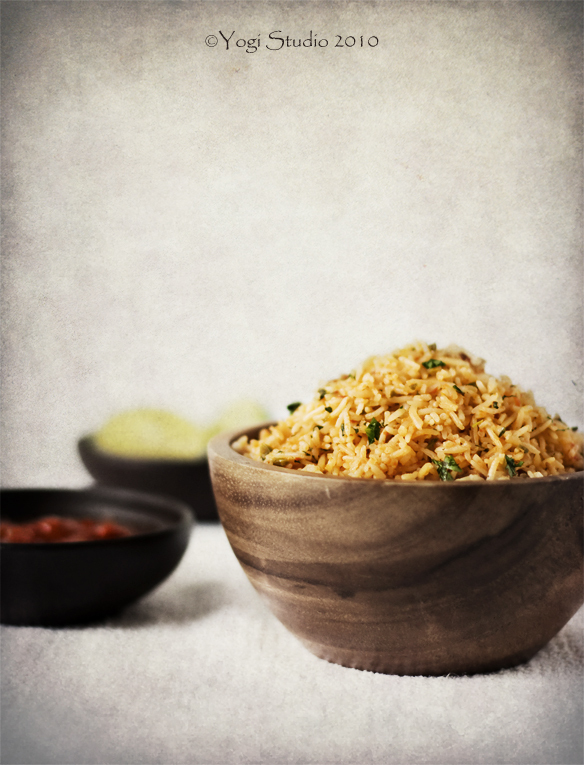 Fluff up the rice with a fork, stir in minced cilantro and serve. 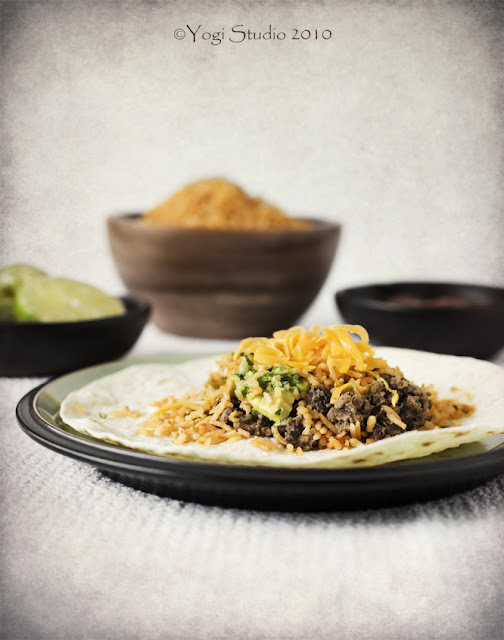 The following is a really quick and easy way to make beef with beans to accompany the rice in the burrito. I am not sure if this is authentic or not, but it certainly taste good. Heat heavy 10" skillet over medium heat. Add beef and cook until brown, breaking up clumps with wooden spoon, about 4 mins. Add chopped onion and garlic, cook until onion is transparent, stirring frequently, about 3 to 4 mins. Stir in cumin and cook for 1 min. Add beans, broth and green chilies. Cook until beans are softened, about 10 mins. Press and crush beans with back of spoon, continue to cook until beans are creamy and thickened, about 5 more mins. Mix in green onion. Assemble burrito by wrapping in a tortilla with any combination of beans, red rice, cheese, salsa, gucamole and sour cream. I'm crazy for rice, too. This sounds incredible! @whisk-kid - Sounds like you are a "rice bucket" too! @Linday Jewell - Thank you for visiting! I've got the wooden bowl in a discount store. Very inexpensive! The red rice alone looks flavorful enough, yet I believe I'll enjoy it with the beef as well. I love that recipe, and use it all the time to make spanish rice. Very flavorful. @TasteHongKong - Yes, the rice and the beef and beans is a very good combination. Thanks for stopping by! @Kate - You must be like me, a fan of the American Test Kitchen! omg this looks fantastic! i too love rice. i can't wait to try this! and what makes it even better, is that my mom hates rice, so i can eat it all! @Justin and @Jasmine - Welcome to me blog. Hope you like my photos and the food! Recently found a new love - baking bread specifically. The whole process is therapeutic and rewarding. Of course there are successes and failures. But even when it's a failure, you will still have something that's edible. And failures enrich your experience and push you to do better next time. Happy baking!